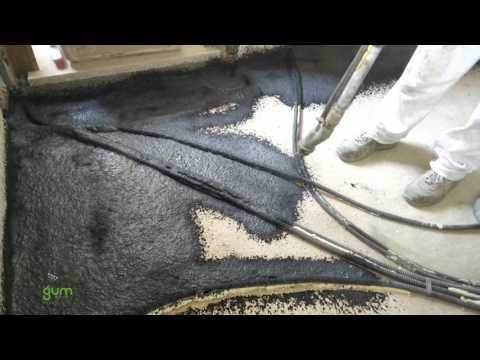 Impact noise insulation layer to be realized directly on site, composed of premixed SBR rubber granules with controlled grain size and unique selected pre-batched binders, packed into bags, to be mixed with a second liquid additive (B Part), for a mechanical or a manual application. ■ Resilient layer for the reduction of impact noises in systems made of floating screeds, particularly suitable in the realization of floating screeds with a low thickness, also in case of installation without levelling layer. ■ Reduction of impact noises on stairs. ■ Acoustic impedance layer, to be applied in spaces between walls of double brick partition and in spaces between walls of sheets tackles on clay-cement mix walls. ■ Realization of separating under-wall layers or covering of acoustic bridges, such as pillars and concrete beams. ■ Acoustic insulating treatment of inner courts for the passage of installation, individual discharge pipes made in pvc or similar. ■ A PART MUST BE OBLIGATORILY MIXED WITH B PART. ■ Premixed SBR rubber granules: bags of 24 kg. ■ Liquid additive (B Part): package of 3 L.